As part of the overall maintenance and repair programme for fire hoses, the keeping of accurate records is essential. The effort and expense of testing is only justified if the results are traceable to the specific equipment so, as well as keeping a track of valuable assets, the marking of the hoses and equipment ensures that the items are logged, recorded and, in the event of any accidents or incidents, it can be demonstrated that reasonable duty of care has been exercised in the customer’s attitude to their equipment and workforce. In all cases we design the system to allow the customer and Fire Hosetech to identify the product from the unique serial number and to use that number as the key to the database entry that records information such as – in the case of hose: the manufacturer, age, diameter, length, coupling type and material, its location and engine no. where applicable. In addition, over time a comprehensive record is constructed, detailing the work carried out on individual hoses as well as the test results. This information is supplied in the form of an Excel report following annual testing. The records are also retained centrally by Fire Hosetech and can be supplied to bodies such as the Health and Safety Executive if requested and authorized by the client. We can deal with a no. of forms of asset marking and are happy to discuss customer’s specific requirements with them. 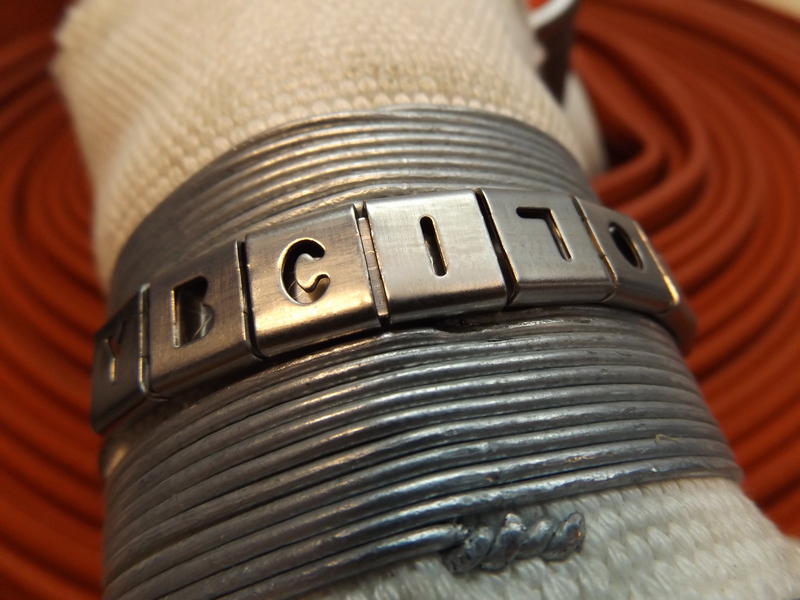 One of the most common, simple and robust methods is the use of stainless steel bands with “easi-read” alphanumeric characters. We also have customers who prefer bar codes or shrink-wrap numbering systems and we are working to introduce an RFID tagging system to speed up identification in the future. We can work with your existing asset tracking system or we could combine the easy read method with your own system for a comprehensive asset management programme. In the example shown here, the number reads “YBC17012”. The next alpha character signifies the hose diameter. In this case “C” for 70mm hose. The next two numeric characters show the year of manufacture – particularly useful if you work on a timed replacement programme or wish to use the age profile as part of your budget planning. The final 3 numeric characters, in this case “012” show the no. of hoses of that type and diameter purchased that year at that point. This system is very effective, easy to use, understand and offers a huge amount of flexibility allowing it to be easily tailored to meet customer’s specific needs and requirements.